Beyond The Picket Fence: Fall Junk and I Need Your Ideas! Fall Junk and I Need Your Ideas! I am getting ready to decorate for fall. I know, I am way behind some of you. It has been 90 degrees here this week, so fall has not been on my brain. Here are some things I picked up to get me started. 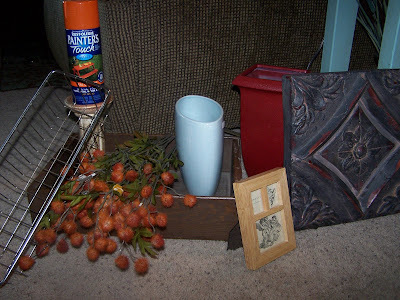 The spray paint and fake orange weedy things did not come from the thrift store, the rest of the stuff did. I will show you the transformations in a day or two. I may not use all of it, but do have a few ideas. 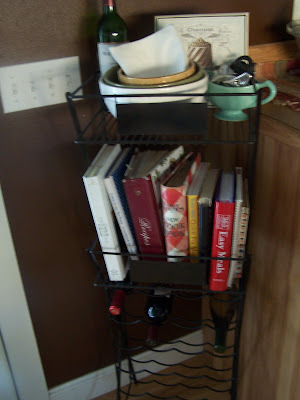 This wine rack I picked up for $5 at the thrift store (I know, my wine collection is extensive). It was gold, I spray painted it with the oiled bronze spray paint. The little rectangular pieces on the front of each "basket" said Kendall Jackson. I need your ideas as to what to put on there. I have thought of scrapbook paper or vinyl words, but what should it say? Help! 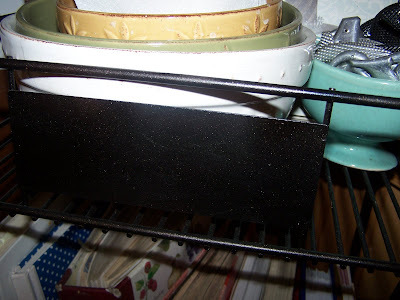 Paint it with chalkboard paint. Then, you can change whatever you want to say depending on the holiday or season! How about the word wine in different languages. How about "Bon Appetit" means "Good appetite (or enjoy your meal) "for the first and the toast 'A Votre Sante' - means "To Your Health" for the second. What about chalkboard paint... then you can change your message daily... very cute. Can't wait to see your fall display. What about words, learn and read or something like that? Books, things? I have to agree with everyone else - the chalkboard thing sounds like a great idea! Great finds. I bow to your creative conclusions on these projects. I can't wait to see an after pic or two. I was also going to suggest the chalkboard paint before I saw that some of the other savvy posters already had. Wow, love your painted furniture! I'll surely be back to look at more, I'm a fan! What's Green and White and Black All Over?